Gov. Tom Wolf on Friday signed into law major new anti-hazing legislation introduced following death of Penn State student and fraternity pledge Timothy Piazza. The Timothy J. Piazza Antihazing Law, introduced earlier this year by state Sen. Majority Leader Jake Corman, R-Benner Township, toughens criminal penalties for hazing and increases requirements for institutions and organizations. Piazza, a 19-year-old Penn State sophomore and fraternity pledge, sustained fatal injuries in February 2017 after falling during an alcohol-fueled initiation at the now-banned Beta Theta Pi fraternity. “Tim’s tragic experience has led to real change. There is no place for hazing on our college campuses. And together, we will protect students and hold accountable those who engage in it,” said Governor Wolf. “We mourn for Tim’s loss with his family, and while we can never fix what they’ve gone through, this new law will help to prevent other tragedies. 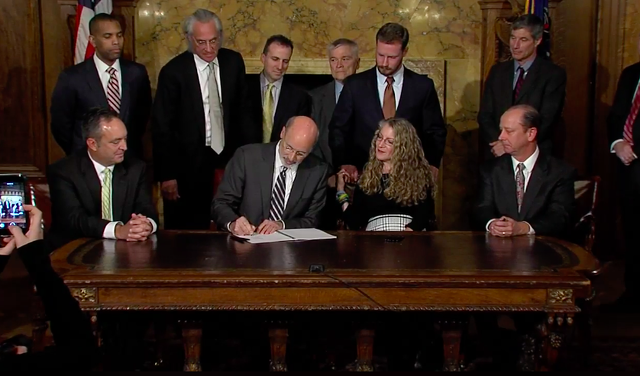 At the bill signing in Harrisburg, Wolf and Corman were joined by Piazza's parents, Jim and Evelyn, brother, Michael, Penn State President Eric Barron, and Pennsylvania State System of Higher Education Chancellor Dan Greenstein. The new law, which goes into effect in November, adds aggravated hazing, a third-degree felony, for hazing that results in serious bodily injury or death. Hazing that results in bodily injury remains a misdemeanor. It defines hazing as making a condition of membership consuming any food, drink, alcohol, drugs or other substance which subjects a minor or student to physical or emotional harm; enduring mental, physical or sexual brutality; and any other activity that creates a reasonable likelihood of harm. 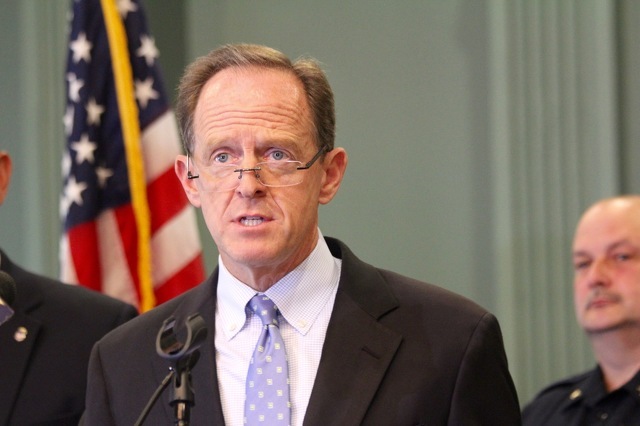 New organizational and institutional hazing provisions also are included in the legislation for entities that knowingly or recklessly allow hazing or aggravated hazing to occur. Penalties can include forfeiture of property. Schools are required to have anti-hazing rules, enforcement policies and preventative measures and to make information about hazing violations available to the public. It also establishes a safe harbor clause for students who call for emergency help for an individual who has been hazed also is included. Similar to the state's drug overdose immunity law, the person who calls for help and waits with the victim for emergency personnel to arrive would be immune from prosecution for hazing. Barron said he is hopeful the legislation along with other measures will "prevent another tragedy from occurring.” He added, however, that change is needed nationwide. U.S. Customs and Border Protection in June seized an illegal shipment of 110 pounds of fentanyl at the Port of Philadelphia. While at a glance that amount may not seem like a significant drug bust, it only takes two milligrams -- about the size of a few grains of table salt -- to potentially kill an adult.